In Sacramento, plumbers are busy around the holidays. From dinner parties to in-laws staying for a week or two, more people in the house means more that can go wrong. A nephew may try to flush wrapping paper down the toilet. A string of hot showers can push a failing water heater over the edge. But one of the most common holiday-related pipe problems is a gummed-up garbage disposal. Thanksgiving dinner is known for its leftovers. It’s also one of the biggest culprits when it comes to stopping up that seemingly magical and blade-filled hole in your sink. As amazing as a garbage disposal is at whisking away unwanted scraps, it’s not all-powerful. According to the Food Network, there are more than half a dozen foods you should send straight to the garbage can or a compost pile. 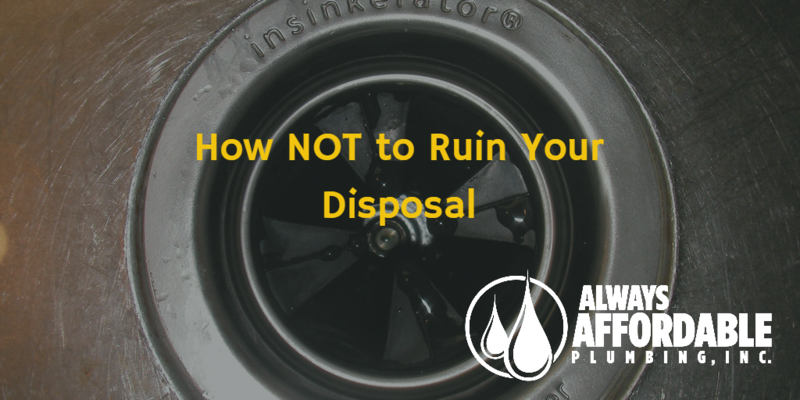 Keep these out of your disposal, and save a call to Always Affordable Plumbing for when you discover a burst pipe or something worse. Tough and fibrous celery bottoms can split into thin cords that tangle up a disposal. Toss them in the trash. Everybody has a hard time chewing these woody green bits. A garbage disposal is no different. These can wrap around the blades and grind it all to a halt. These may seem slippery and easy to rip, but the strands inside the peels are yet another food product that can tie your blades up in knots. Bones are strong for a reason. The fact that they are sturdy enough for walking and flying (depending on the animal) also makes them off-limits for grinding up. The shells of many nuts can be almost as hard as wood. They can easily wedge into gaps and shut down your disposal. A peach may be soft, but at its center sits a heart of disposal-busting hardness. Also beware of plums, apricots, cherries, nectarines, and other stone fruits. If your uncle does put any of these down your garbage disposal while “helping” clean up, Always Affordable Plumbing can come to the rescue. Call AAP, Sacramento’s 24-hour emergency plumbing service, any time! Garbage disposal jammed up? CALL ALWAYS AFFORDABLE PLUMBING, 24 hours per day for plumbing emergencies. Whether you need a FREE Home Plumbing Inspection, emergency 24-hour plumbing services, leak detection, or just need us to fix that disposal, Always Affordable Plumbing is serving Sacramento with the BEST and MOST AFFORDABLE plumbing.